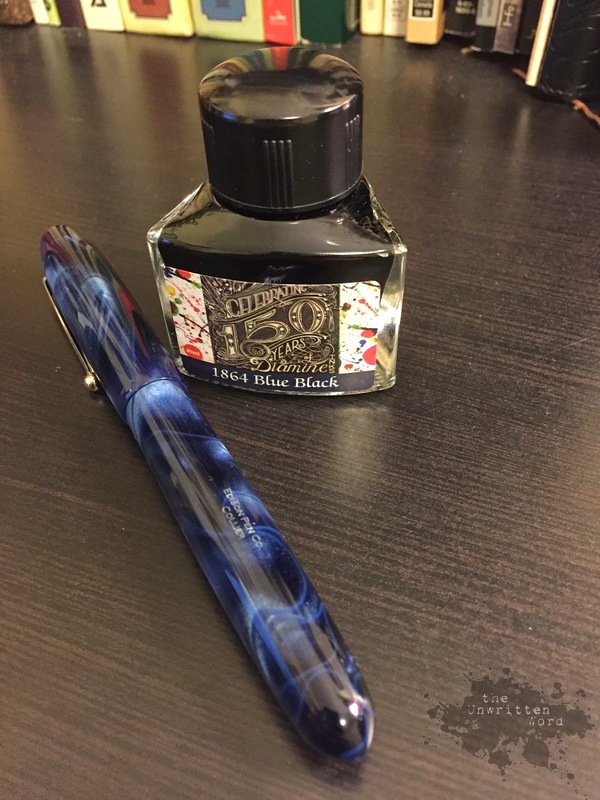 I've done a lot of ink reviews for the Tools of the Trade portion of the blog. There are several reasons, the first and most obvious one that I enjoy playing with new inks and sharing my thoughts. They're also a pretty straightforward post topic, and they're easy to get up here even when the thinkiest parts of my brain have dripped out of my ear. They're just not complicated. Another way to say that is that they're not adventuresome, and I have many a Tuesday when I'm glad about that. It all started innocently enough. My friend Derek paid us a visit and brought along a few favorite inks and pens for Husband and me to try. He had Iroshizuku Shin-Kai loaded in his Pilot Vanishing Point with EF nib, and I thought it would be such a simple thing to scrawl down a review. Things went well...at first. I wrote happily for a little while to get to know it before I wrote the review. "This is a nice, if unremarkable, ink," I thought. "This is as well-behaved and earnest as any other Iroshizuku, though it's hard to see its character in such a fine nib," I mused. Innocent. Unknowing. Doomed. After some writing, I had to top off the pen. This is where I went wrong. 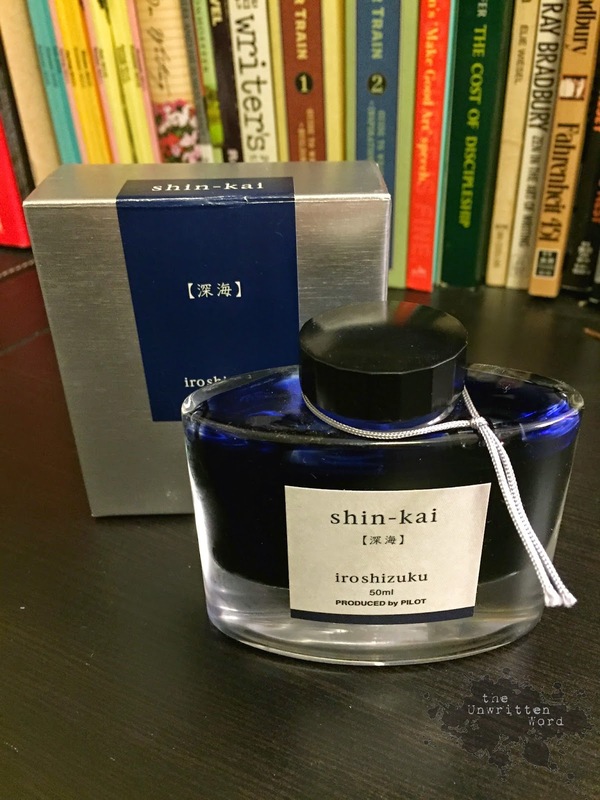 You see, Pilot Iroshizuku ink comes in some of the loveliest glass bottles you can buy. They're really well-designed and attractive. They even have a cute little string around the bottle neck, which can be used to catch drips from running down the bottle or just to look like a dapper little necktie. 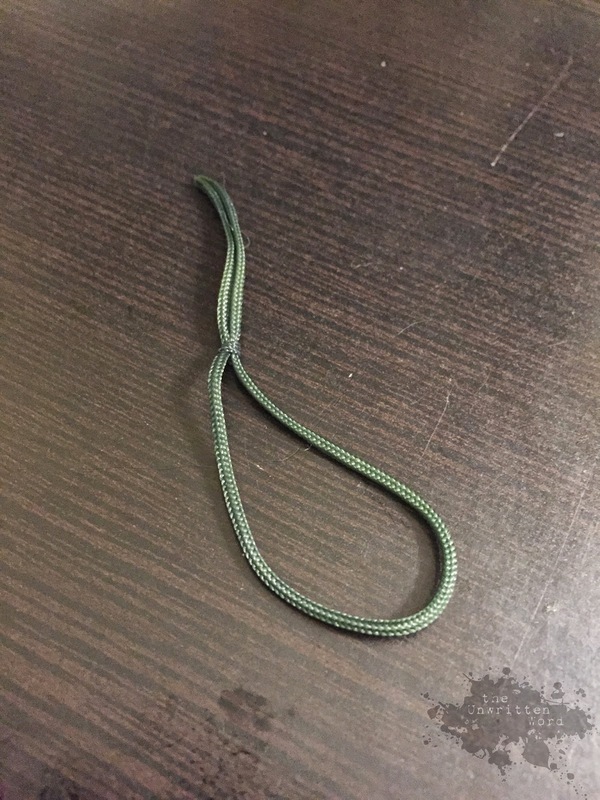 I'm choosing to think of this one as a noose. When I topped off the pen, I neglected to pay attention to where the string was hanging out on the threads. I managed to get the cap on...sort of. I put the ink bottle back into the box and handed it off to Derek before settling down to write my review. Then, I hear, "Uh, what's happening?" come from Derek who has a growing puddle of blue ink burbling through his fingers. I grab the box from him and head to the bathroom with it, expensive blue ink running down my hands. Derek has gotten it on his t-shirt and now has a blue spot on his stomach that looks like he's been attacked by a kamikaze Smurf. I get the box into the sink and find the string wedged under the cap, keeping it just crooked enough to cause a flood. And flood it did. We had ink everywhere. Derek and I definitely make a good disaster-control team, and somehow we spared my carpet, but I don't think I'd want to relive it. 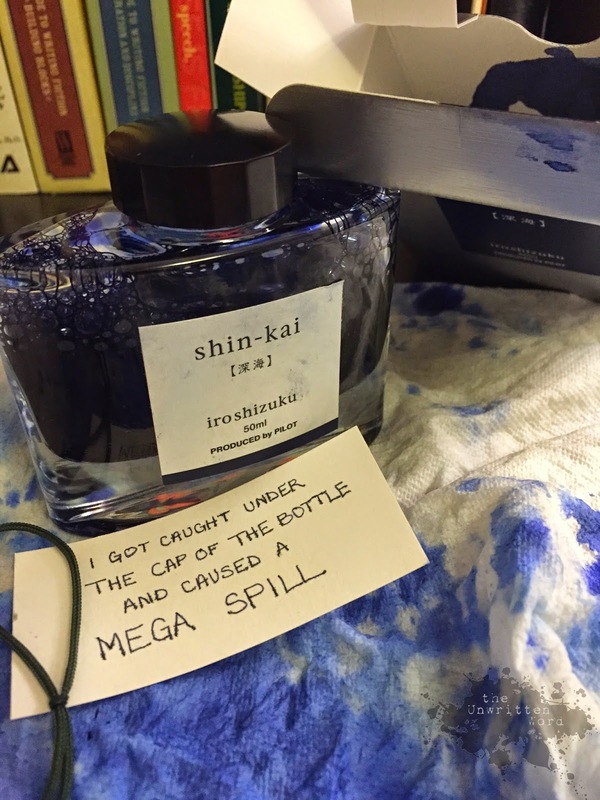 If you get this or any other Iroshizuku ink, you're nearly guaranteed to love it, but watch those pesky nooses! They're out to get you. As for the ink itself, it is a pretty straightforward dark blue to blue-black color. It's inoffensive and utilitarian...until you spill it. 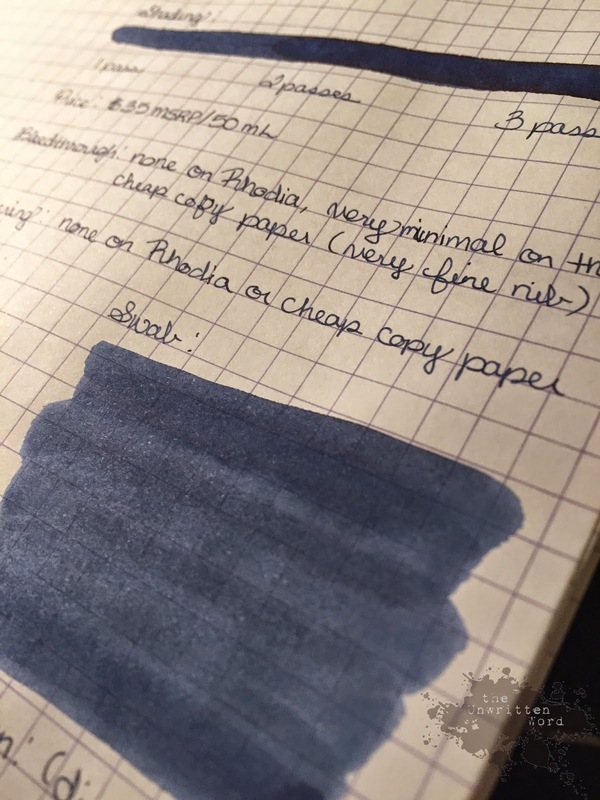 It seems to have less depth than many other Iroshizuku colors I've tried, with the swab coming out a little chalky even, but let me tell you, it sure was pretty running down my sink, and my cuticles were dyed the deepest blue for a long, long time to come. If you're in the market for a steady blue-black, Shin-Kai will probably fit the bill just fine, though there are a lot of cheaper options out there. 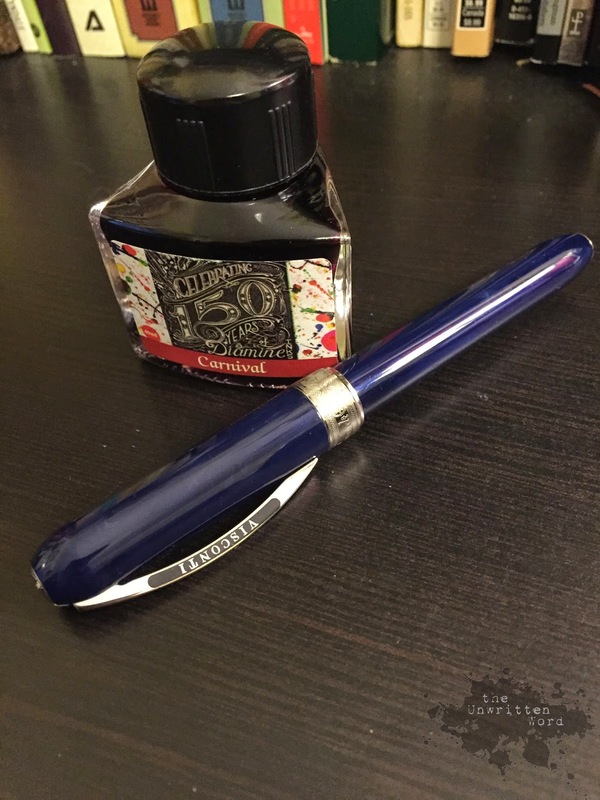 Personally, I have fallen in love with the whole Iroshizuku line for their universal good behavior, and having a trustworthy ink in a beautiful bottle is just about worth it to me for the extra expense. Just don't spill it. Don't. 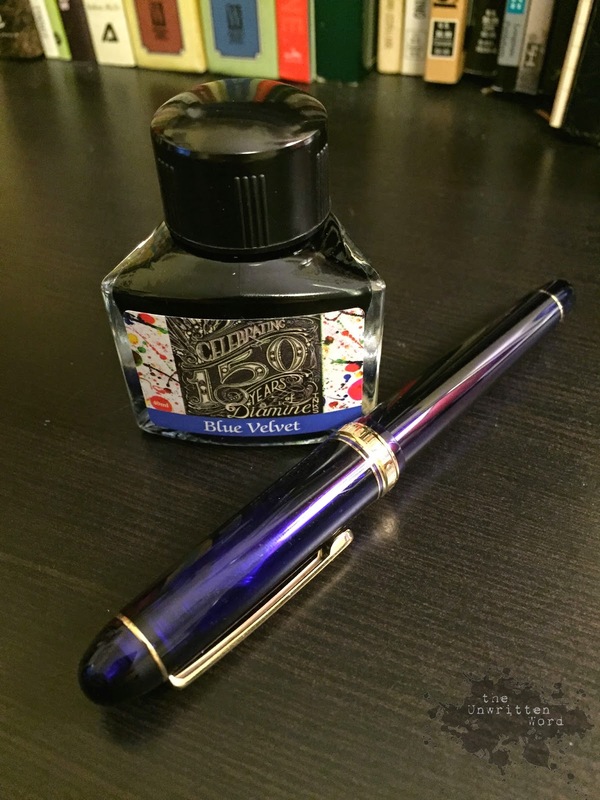 Tools of the Trade Mega Review: Diamine 150th Anniversary Inks--All of Them! 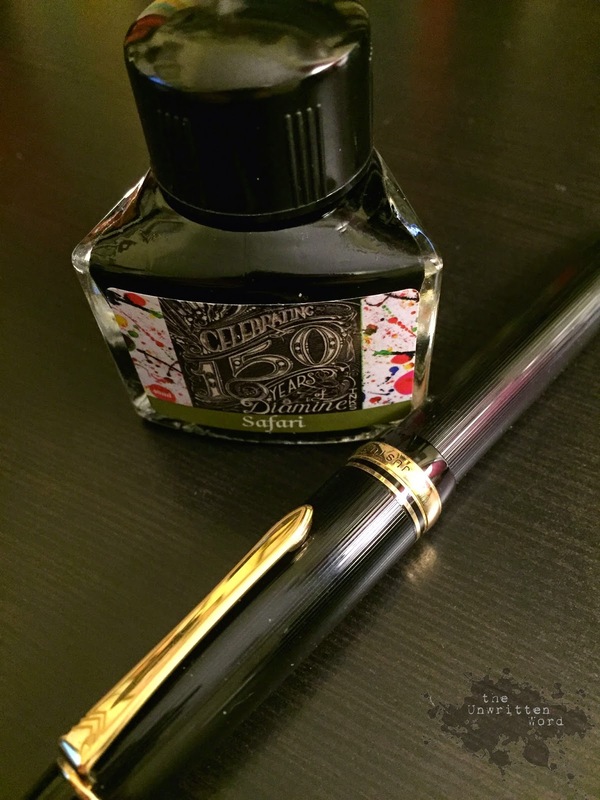 A while back, I promised in-depth reviews of the new Diamine 150th Anniversary ink set. I meant to get to it before now, but since I don't have a time machine (or do I? ), I decided I would just cut to the chase and post all the reviews in one fell swoop. Overall, though each of these inks has its own personality, I can say that they are universally well-behaved and pleasant to use. I spent about a week writing with them sporadically, and never had any issues with hard-starting or clogging. I think it's fair to judge these inks by their color and not worry too much about letting it touch your beloved pens (as long as you're good with your pen hygiene! You can't blame the ink if you let it sit for months and it ruins your pen). It is my understanding they will be available on a continual basis, so don't be afraid to fall in love. Blue black is one of those colors everyone needs, so all the pen/ink manufacturers have some variation. Several of the ones I've tried have ended up being a kind of chalky, sometimes almost greenish dark blue, but not what I would call truly blue-black. Not so here. This is as true a blue-black as ever there could be. It's dark, very, but the blue shows up in the light. When I go hunting for a stolid, almost intimidating blue-black, I think this will be the one I reach for. My only issue with it is that it is not even remotely water resistant, so that is something to consider if signing documents. I am a long established blue ink junkie. I have more bottles of blue ink than any other color, and I know them all by heart. There are three blues in this set, but Blue Velvet was the one that stole my vision. 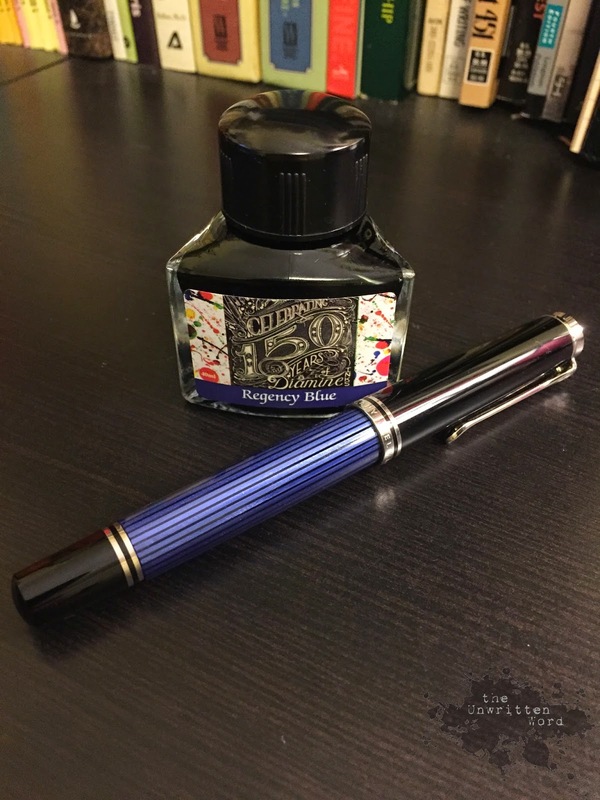 It's just gorgeous, and though nothing (nothing) captures the vibrancy of Noodler's Baystate Blue, this is a good substitute if you're after a soul-stirring true blue ink. This is the one ink in the set that I was most concerned about with regard to behavioral problems. It's red. 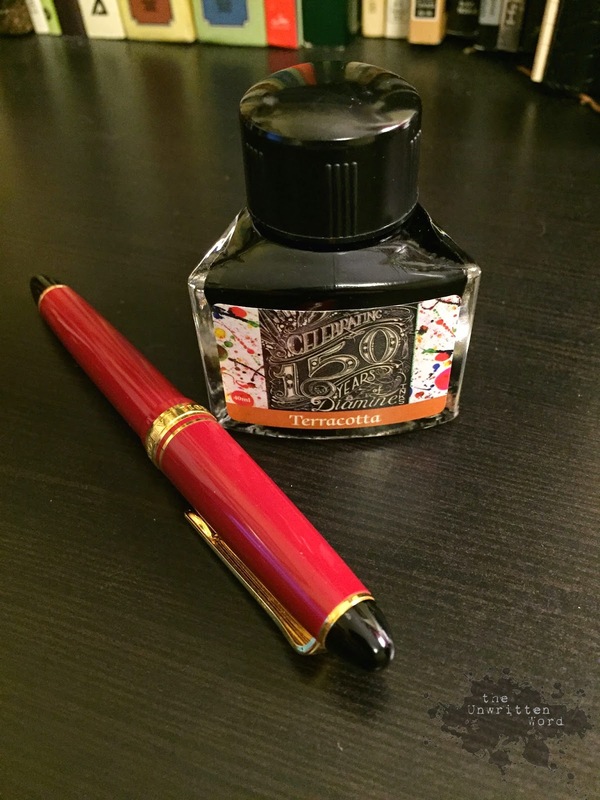 I love a good deep red ink, which this one is, but red dyes are notorious for staining. I'm pleased to say this ink did not end up leaving its mark on my pen, but I did make sure not to leave it in the converter for a long period time. That's just good practice anyway, but especially with red inks. That said, I love this color! It's a rich, true red without leaning too much to the orange side. I am really going to enjoy this one, and it will likely replace Diamine Poppy Red as my editing ink. Regency Blue covers the place between the rich, true-blue of Blue Velvet and the near-vacuous 1864 Blue Black. It is a dark blue, but a true one, and would be the kind of ink that could fill almost any need handily. It is a highly saturated ink, much like Diamine Majestic Blue or P.W. Akkerman Shocking Blue, but it is missing some of the sheening qualities those display. I suspect that may be why I had such a different experience with clogging here. Both Majestic Blue and Shocking Blue are deep and fascinating with the red sheen puddling up from heavy areas, but they also clog like crazy in a very short time. I did not have that problem with Regency Blue. Do I miss the sheen? I do, a little, but that's not the only reason I reach for a rich blue, and it's good to know there is a better-behaved version in my collection. I don't think there are many other inks out there that fit this unique niche. I don't know what it is about this shade that intrigues me, but for some reason it catches my eye. I love olives, but if you ever asked me where olive green rates on my list of favorite colors, it would be pretty far down the list. I mean, it's like The Brady Bunch's carpet, right? However, there is something about the context of this color as an ink that works for me. I have to lump this one and Terracotta together as my "sleeper" inks, ones I wasn't sure I would like that I ended up enjoying a lot. The closest other color to this that I've used is Rohrer & Klingner Alt-Goldgrün, which I sampled as a potential match to my Pelikan White Tortoise m400. This ink is almost a dead ringer, maybe missing just a little yellow pop. I think it's going to get a surprising amount of use. Silver Fox stands out as the mildest ink in the set, a mellow gray whispering to be seen among the likes of stunners like Blue Velvet and bullies like 1864 Blue Black. When it gets its chance to shine, though, it's such a lovely color. I really like the look of a full page written in a friendly gray. It reminds me of my pencil days without the threat of erasure. Unless there is water, of course. 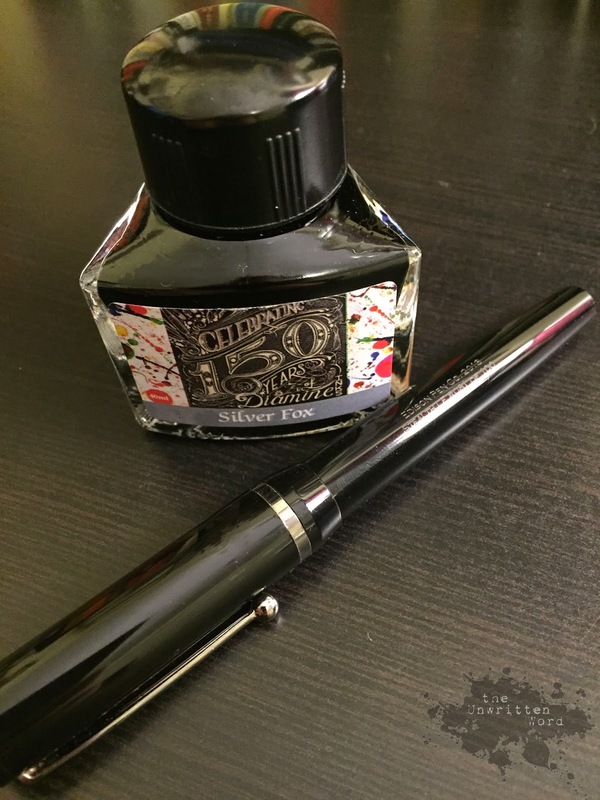 This stuff ceases to exist when wet, but what do we expect from such a polite ink? Tropical Green is probably the green equivalent to Blue Velvet for vibrancy. Diamine has a lot of greens to choose from in their line, but Tropical Green hits that middle-green area with fervor. It leans a little toward the blue, but it knows who it is. It is Tropical Green, mighty, strong-willed, and pretty good at shading. 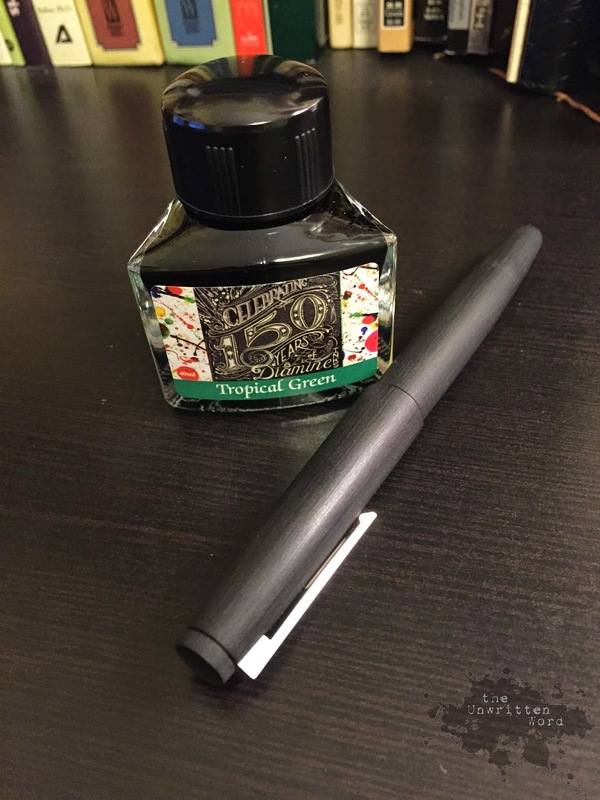 I don't have a ton of green inks in my collection, and if you're only going to have one, this is a good candidate. This concludes your 8-for-1 ink review special! If any or all of these inks strikes your fancy, you can snap them up one at a time or as a set. Again, I'm grateful to my friend Derek for giving this set to Husband and me for Christmas, and grateful to Vanness Pens for answering the phone when he called to snap it up about as quickly as they had unboxed it. It's rare that I get to be a front-of-the-line person, and it was pretty cool being among the first to try these out. It's also cool getting presents you really love from friends who share your interests. They're worth their weight in gold (nibs or otherwise). Today I got to conduct a training for some colleagues on Motivational Interviewing. If you don't know what that is and you actually care, you should do some research. It's a good communication tool even if you don't work in a therapeutic field. I love teaching. It gives me a chance to teach the way I'd want to be taught, and it also gives me a chance to watch how others learn. That tells me a lot--about myself, communication, and people. Today, it dawned on me I have been missing some opportunities in my writing. 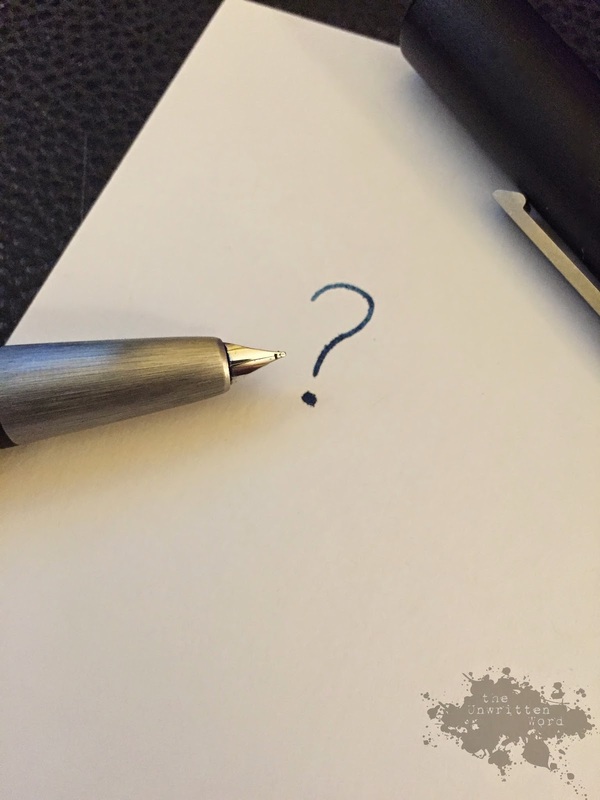 One main skill of Motivational Interviewing is using open-ended questions. It doesn't do much good to guess at what is going on with a person giving you "yes" or "no" answers when all you have to do is phrase your question differently. You might get an answer you didn't expect. Why have I never used this in consideration to my characters? (Well, yes, I do realize they're not real, but work with me here.) Usually, when I think through a hypothetical conversation with a character, it is more like, "You like the dashing hunk who just came on the scene, don't you?" Whereas, I suspect some of these very characters, if asked openly, "What do you want to do?" would say, "Eat some ice cream and take a nap." Okay, this doesn't do much for plot, but it sure helps me know my characters better, and it can be a big hint if I'm getting off track trying to have them fit my mold. Fictional people are just as frustrating about not wanting to fit molds as real people. I promise. If you want your characters to read as humans, they have to behave as humans, and that requires respecting them as such. If you think of them like real people and try a couple of these techniques, it might surprise you what life starts creeping into your work. I have been away from the blog for a while, and to be honest, from my writing in general. Everyone needs a break sometimes, and there are only so many things that fit on a person's plate before things start glopping over the side. I noticed a few things while I was on hiatus from the literary arts. None of it was a surprise. 1) I need to write to live. I don't mean this as one of those cheesy sayings that people slap on t-shirts to hawk on Facebook. I don't mean this as a Thing to Say to Convince Others I'm For-Serious Going to Be a Famous Novelist One Day. I'm not going to be famous. I don't think I would want to be. What I do mean is that writing is that one thing I do that helps me keep track of all the things in my life, consciously and subconsciously, and to have an outlet for the geyser of creativity that lives in me and is constantly under pressure to escape. In other words, it allows me to live an authentic life and not just survive. Living and being alive are different. I prefer to live. 2) Writing and reading are the same thing. I tried spending time with some of the good, good books on my To Be Read pile. Every single time I got to a line I loved, I couldn't sit still and think, "Wow, good job, author!" I thought, "Oh my gosh, how can I do that? Let me pick it apart syllable by syllable and see why the sentence is so musical." I don't think I can ever go back to passively reading a book, and I'm okay with that. Still, when I don't have enough time or energy to fall face-first into my own work, it can make me reticent to read something I know will stimulate all my book-loving neurons and set me on fire to write. Because the good ones do. Always. 3) There are a lot of episodes of Murder, She Wrote. While I wasn't writing, I watched a lot of Netflix. I love old shows, and it was only a matter of time before I went down the cozy mystery rabbit hole. First, why would anyone be friends with Jessica Fletcher when you know someone is about to go belly-up every time she enters the room? Anyway, every time Angela Lansbury says something humble about her prolific backlist and making time between police investigations for her new book, I feel guilty. I mean, I don't even solve murders, and I can't make time for my book. I know it was the 80s and there was no Netflix and no iPhone games, but still. Guilt. I feel better. I feel more like myself. From now on, I take my morning coffee with a lot of cream and a little bit of ink on the side.